Things have been a little slow around here, but that is because I've been working on another project. This is a new site that will cover all things fly fishing here in Tennessee and feature my guiding as well. The current URL is a practice run, so it may change somewhat. Right now it is nowhere close to complete although I'm making progress. In the meantime, I would appreciate any and all feedback. You can visit the current site at www.davidrknapp.com. I know there are lots of blank pages, but I'm working on getting them filled in. Right now I want them up so you get the general idea of how the layout of the site will work. So, what do you think? Is it easy to navigate? Does it look like it will contain useful information once I get the pages completed and more added? 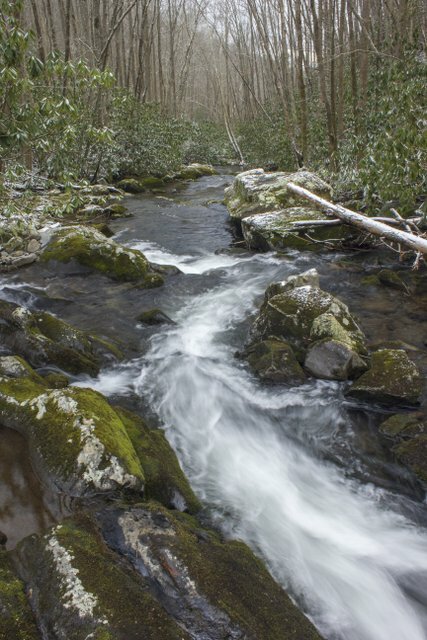 I intend to cover all major watersheds in the Smokies including tributaries, fishing techniques for the Park, Tennessee tailwaters, and warm water streams and techniques for those as well. I'm still debating whether or not to merge this site with Trout Zone Anglers and/or this site (the Trout Zone) although I kind of hate the idea of changing platforms for this blog after all of the years of hard work I have gone through. As the calendar turned from 2015 to 2016, I began to think about fishing goals for the new year. I'm not a resolution kind of a guy because why wait until the calendar changes to get things on track? However, from a fishing perspective, it is easy to get stuck in a rut and keep doing the same thing each time I get out on the water. With that in mind, I've set a goal to catch a brook trout each month of the year. Originally I even contemplated doing it using dry flies only or maybe Tenkara, but for now those ideas are on hold. 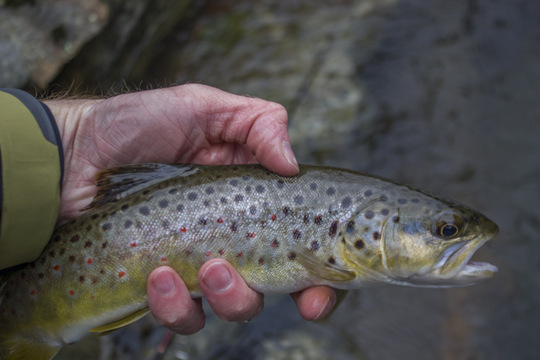 Still, when I decided to head up to the mountains this past Sunday, I knew the early morning hours would be spent chasing brown trout. After having such a good day the previous Sunday, I figured it was too good an opportunity to ignore. I still had that monster to track down and land. For some reason that fish was nowhere to be seen. After doing a lot of scouting and a little bit of casting, all I had to show for it was 3-4 half hearted chases and one fired up fish that couldn't find the hook. The time had come to move on to plan B. Before heading to one of my favorite brook trout streams, I rolled into Townsend to warm up and chat with the guys at Little River Outfitters. A short stop turned into a longer one as the nice warm shop was hard to leave. 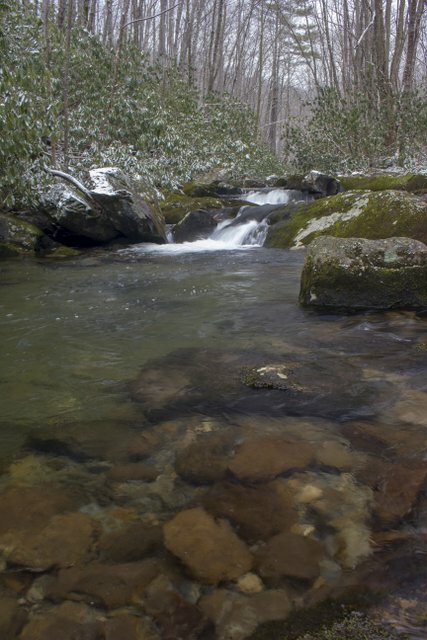 I knew that I might not get back to the mountains much again in January though so I eventually forced myself back out into the cold to go find those brook trout. When I lived in Colorado, winter time streamer fishing on Boulder Creek right in the middle of the town of Boulder was one of my favorite things to do. I could get out for an hour or two, walk the ice along the banks, and maybe even catch a trout or two. 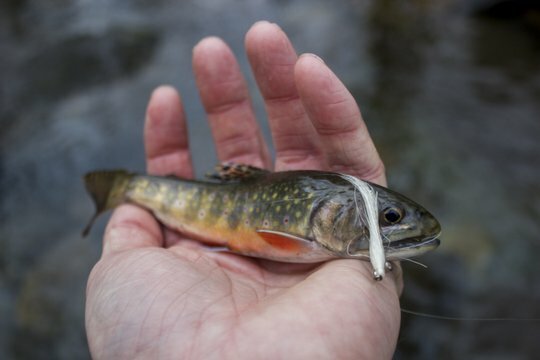 Often I would be surprised by nice brook trout that hammered the streamer so I knew that they loved streamers. 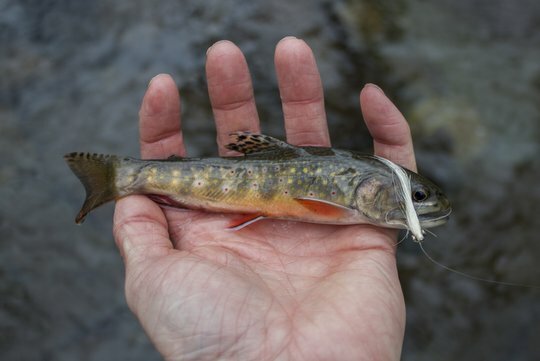 If you know me this is probably shocking information, but I actually have not fished streamers for brook trout in the Smokies, until this past Sunday that is. 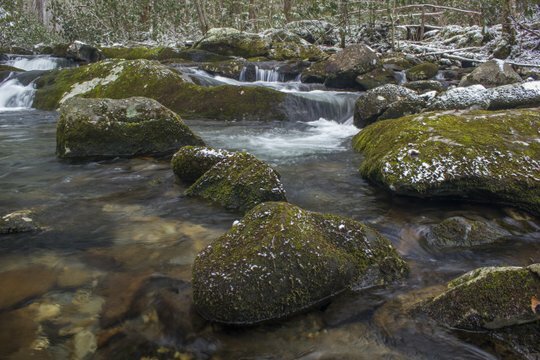 As it turns out, the native brook trout of the Smokies like streamers as well although water temperatures in 30s meant that the hits were few and far between. I did get this beautiful fish on just the second or third cast which meant I could relax the rest of the time and not worry as much about catching trout. Able to enjoy myself, I spent more time looking around than fishing after catching that trout. My camera provided another avenue of enjoyment. Here are a few of the stream shots. Notice the dusting of snow on this cold January day. 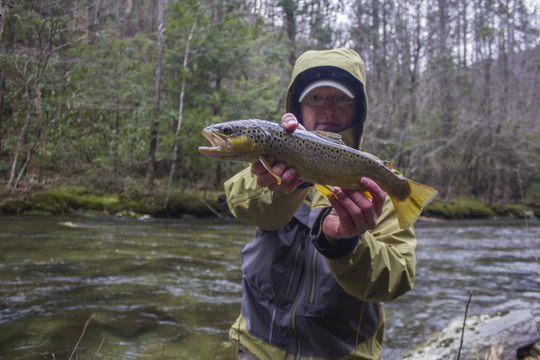 As the calendar rolled over from December into January, a host of things prevented me from getting out on the water much other than one guide trip in the Smokies last week. The guide trip went well. Despite cold water, we found a few trout willing to eat our flies. As a guide, I often enjoy putting people on fish nearly as much (maybe more?!?) as catching them for myself, so that trip was great for many reasons. However, it was time to catch some for myself. My buddy Tyler was free to fish for a short time and the air temperature was low enough that I didn't want to be out long. 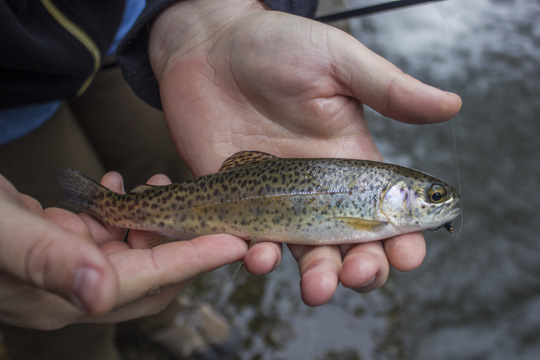 We met up at Cumberland Mountain State Park for a quick trip to get that first trout for 2016. I had the Tenkara rods along and Tyler was intrigued enough to want to fish with them as well. We strung a couple of them up with the usual offering we give to these stocked trout and it was not too long before Tyler struck first. Shortly after, I found some willing fish for myself. 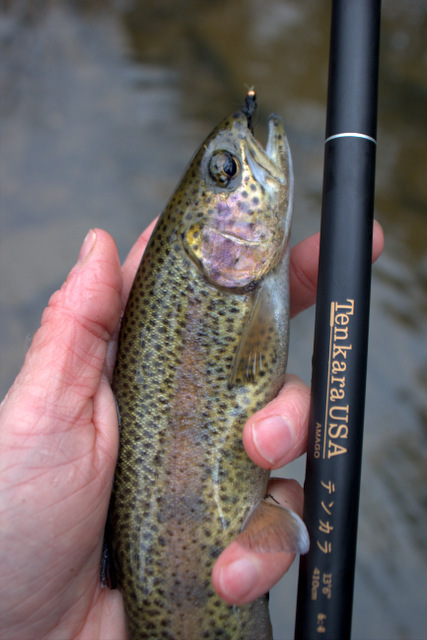 This beautiful rainbow gave the Tenkara rod a good workout. The colors were very good for a recently stocked fish. The fins were all in good shape as well. The fish used in the winter stocking program are generally in excellent condition so someone is doing a top notch job at the hatchery. 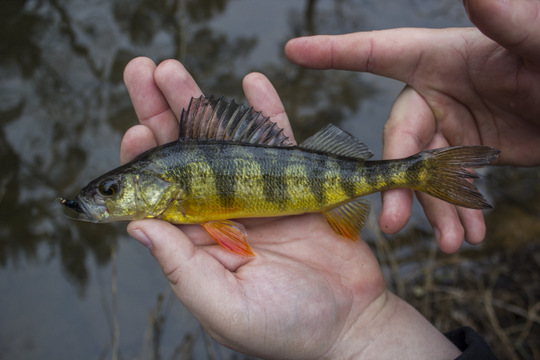 The best part of the trip was when Tyler caught a yellow perch. That was a first for him. I've only caught a handful in my life. His was quite possibly the prettiest I've seen with vibrant colors. Great way to start the new year! How many times can you squeeze "Yellowstone" into a post title? Apparently at least three times. Never limit yourself when greatness awaits. If you can't tell, my creative side is getting close to being shot it seems. Nothing that reliving a trip to Yellowstone can't fix (or maybe worsen, I'm not sure which). Either way, looking back over the pictures from day five refreshed my memory fabulously and I'm excited all over again for what transpired on that day of fishing the Yellowstone River. The discussion on where to fish had began a day earlier, well after dark when we got back to camp from a long but good day in the Lamar Valley fishing Soda Butte Creek and the Lamar Rivers. My buddy Kevin only had two full days available to fish before heading on to fly fishing guide school and we had already used one. That meant the pressure was on to select a winner for the day's fishing. Having fished the Yellowstone River on my last several trips out there, I knew what it was capable of. 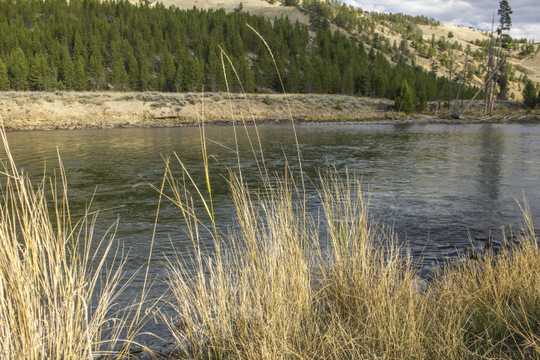 In fact, one of the most memorable days I've been a part of fly fishing wise in Yellowstone happened on that river. Anyway, it always has the potential to produce a quality day of fishing, and in fact, I can't say I've ever had a bad day of fishing on the Yellowstone. Since it was Kevin's first trip, he ultimately deferred to me in the decisions on where to fish so there was a bit of pressure to say the least. For this day, I knew my stream-side breakfast tradition was in jeopardy. 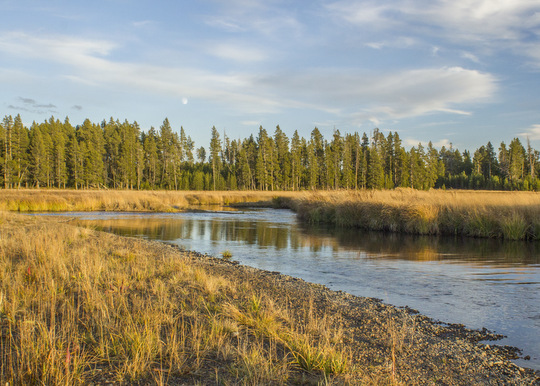 There are few places where you can drive to the Yellowstone in the canyon reaches we hoped to fish. Somehow, eating breakfast in a dry parking lot with a flood of tourists surging past didn't appeal, but something was tickling my memory. That great big breakfast from my first full day in the Park had been delicious, and as we were already driving right past Canyon, why not stop in for round two? Convincing Kevin was not too hard at all and we left in time to be there right as they opened. With a good breakfast behind us, we were ready to hit the water of the mighty Yellowstone River. Hiking down from the shortest access at Tower Falls, I carried two rods. One was rigged with the hopper/dropper rig that had done so well on the Lamar Valley waters while the other was my 7 weight complete with full sinking line. In other words, I was ready to fish streamers. Tied on the end was my favorite, the PB&J. 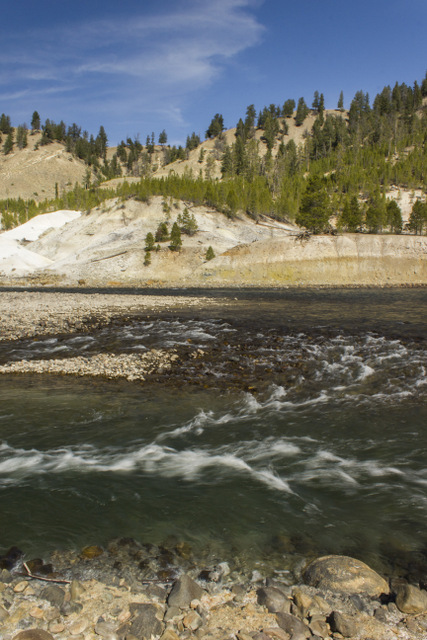 At the bottom of the trail is a huge boulder in the edge of the Yellowstone's flow. I just had to fish there as I do most trips down into the canyon. While normally I'm smart enough to make the long and slightly dangerous hike upstream, trudging up and down slopes along trails belonging as much to the deer, elk, bison, and bears as to humans, this time we had people fishing ahead of us and had no idea how far they had hiked. Might as well enjoy the water close at hand since no one was on it. I had a solid swipe on the first cast and shortly thereafter teased the nice cutthroat back out from under the rock and onto my fly. A quick picture and I tossed the fish back to catch again another year on another trip. We moved upstream to a long deep run just upstream and started working streamers hard. Flashes, taps, and the occasional tug kept us going for longer than I normally would fish one spot. In fact, in all honesty, I believe we could have stayed in that one spot the rest of the day, but the urge to roam was strong and we kept pushing upstream. Only once did we need to leapfrog around other anglers. The main group of competition apparently had booked on up the river to where I normally fish, leaving us the easier to access water down low. Turns out that wasn't a bad thing. 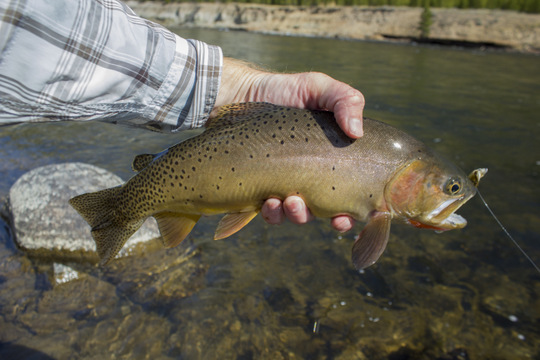 We found more fat cutthroat than is fair for two anglers to catch in one day. We soon arrived upstream at a large pool that I remembered well from past trips. The one thing lacking from my recollections were any particularly great stories about fishing there. That would change on this trip. I had been working up through some pockets and told Kevin to head on up and fish that hole. 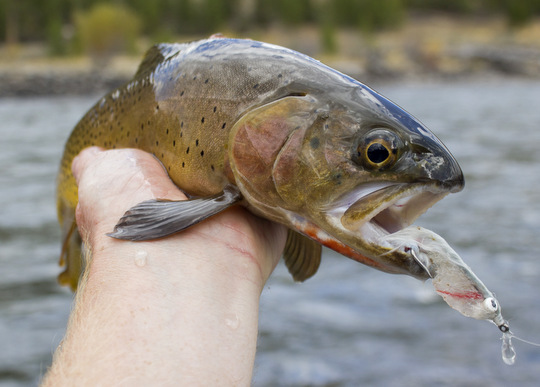 When I moved up, I found him absolutely certain that a large cutthroat had taken at least a couple of swipes at his flies. A high bank loomed over the hole and provided the perfect spot for me to spot from. When I got up there, I started to get a little giddy, because sure enough, there were large cutthroat chasing his fly on most casts. I've been fishing long enough to know many of my shortcomings as a fishermen, and one of those is that I tend to start seeing things by the end of a long day on the water, but these shadows were too well defined to be imagination. Deep bright red along the flanks suggested that at least some of the fish could have rainbow ancestry mixed in, but I've also caught enough large cutthroat to know they can be brilliant red as well so who knows. Yes, who knows, because while some true giants that I'm convinced were in the 25 inch range showed, the best landed was in the 18-19 inch range. That said, both of us were ecstatic at the fish that were caught. I do my best to not complain about the catching. Complaints can affect your fishing mojo negatively. What I can say is that I'm sure both of us will fish that same pool again the next time either one of us is out in Yellowstone. Best of all, we both know what fly they seemed to really appreciate. Notice I'm not telling here, but for the record, it is a fairly common streamer pattern you should find at just about any normal fly shop. The rest of that day was anticlimactic. There were plenty more fish to be caught after this epic pool including some nice ones on the hopper setup. A few hit the hopper, while a good number hit the nymph that was trailing underneath. Eventually I set the hopper rod down and went back to streamers because the hopper rod was almost too easy. We didn't fish as late as sometimes, probably because we were both beyond satisfied. The memories of those big fish though kept us pondering and both of us were ready to get up early and head back to the Yellowstone if it wasn't for Kevin's need to depart the next morning. I had some vague plans to sight see and enjoy the scenery the next day. Even though the sun set early at that time of year, both of us were tired enough to enjoy a good supper and a bit of conversation before turning in to our respective tents for the night. 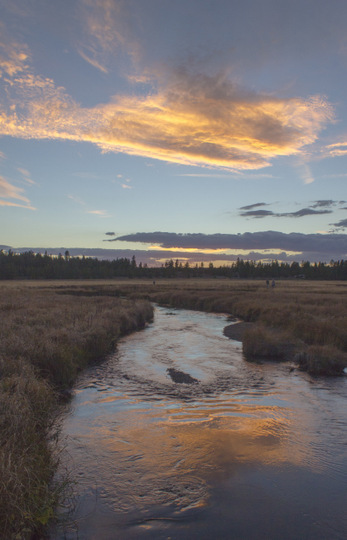 Just before dark, the sunset lit up the meadow that was my usual early or late day fishing spot whenever I was in camp. The rich glow painted the perfect end of day picture as the moon rose to the east until, moments later, the sunset itself was worth a shot.